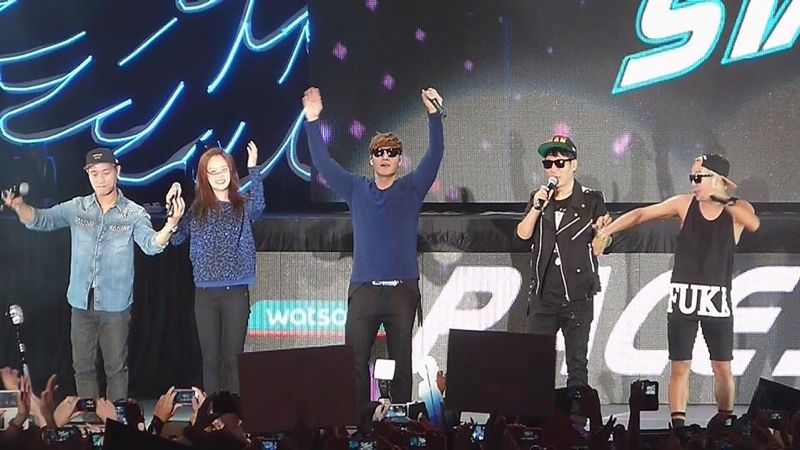 Next, the Running Man cast is going to play games with some lucky fans on stage. I supposed those lucky fans were picked before the showcase. 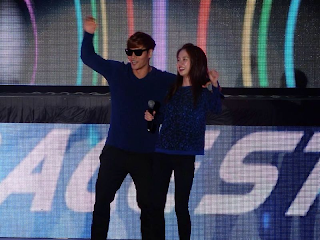 The Running Man cast was divided into two teams – White team (Jee Seok Jin, Gary), Blue team (Jong Kook and Haha) whereas Song Ji Hyo can participate in either team. The first game is a guessing game. They are supposed to stand in a line and a picture was flashed onscreen and the team have to pass the message through body gesture all the way to the last person in the team and the person have to guess the correct answer. Danny teach the Running Man cast to ‘Sabo’ (use tricks to make the other party lose) each other. The first name that came to mind is Lee Kwang Soo who is known for his betrayal. Jong Kook team did pretty well for this game, thanks to Haha who can imitate a monkey so well that they scored a point for their team when they get the answer right. The next game is kicking the slippers into the shoes cabinet and their names were pasted inside the shelf. What a pity! Gary almost kicked his slipper into the cabinet but it bounces off the edge. Eventually, a contestant accidentally kicked a slipper into Kim Jong Kook cabinet and that was a mistake, thus giving a point to Jong Kook team. Next, it was Jong Kook turn to kick the slipper and the Running Man cast keeps teasing him by giving him the pink slipper. Jong Kook rejected their offer and carefully picked a orange slipper that is a bigger size. He almost made it but it slipped past the shoe cabinet. Kim Jong Kook team won the games and they give out the freebies to the participants and took photograph with them onstage. Finally, Danny told the audience to take out their tickets because there is going to be a lucky draw. Each Running Man will draw five tickets from the balloting bowl. 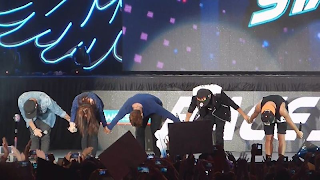 These lucky fans will be able to come onstage to play games with the Running Man. To our disappointment, we did not get chosen and some of the fans were pretty sore about it. Sensing the disappointment, HaHa asked the audiences to be sporting and give some cheers to the people onstage. It turned out that the people who are chosen have to dance to Psy – “Oppa Gangam style” One of the participants even danced forward and shake in order to get picked by the Running Man. Eventually, five participants were picked by the Running Man and the game is sticking post-it stickers on the participants and they have 30 seconds to shake off the post-it stickers. I like the way the four Running Man flower boys chanting, “I am sorry” when they pasted the stickers on the participants. Danny even commented that the way they sing is like ‘hokkien’ song (because of the tone). Before the competition start, Danny asked the Running Man demonstrate to the audience by dancing. 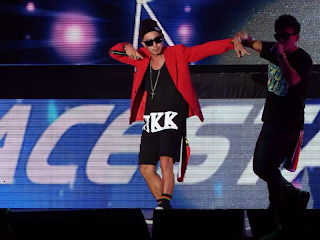 Jee Seok Jin and Gary shake and dance to the music. Noticeably Gary is clearly a good dancer as he move and sway with his signature butterfly dance step. Not to be outdone, Kim Jong Kook showed off his dance move together with HaHa and Song Ji Hyo. Gary looked sad when he said to Ji Hyo, “Why did you dance with them?” Ji Hyo replied, “I love you!” to thunderous applauds and cheers from the audiences. Gary was pleasantly surprised and said, "This is the first time you said that!" 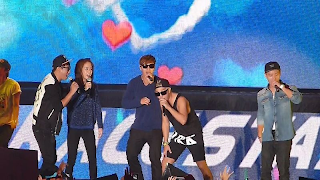 Ji Hyo did a couple dance with Gary, but when Gary attempt to plant a kiss on Ji Hyo cheek, he gets pushed away by her. The game starts and the participants tried their best to shake off the post-it stickers. In the end, Ji hyo team has the most number of post-it stickers left on the guy body. The man was teased by Danny for jumping like a zombie. HaHa on the other hand tried to play trick when he took out the post-it stickers from his team by counting to two when there are more than two post-it stickers left. Therefore, the winner is Kim Jong Kook team who has the least number of post-it stickers. The last game of the day is tug of war and the other five participants will come out and compete with the Running Man team. The person standing behind has to reach out for the bell and ring it in order to win the game. 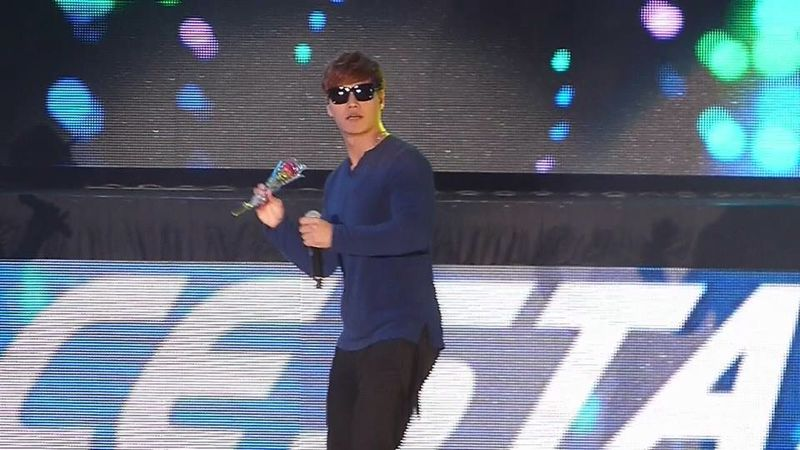 All the participants left were ladies and Danny asked one of the participants, “Are you nervous to face Kim Jong Kook?” The lady said, “No I am not nervous.” Upon hearing that, Kim Jong Kook looked relief and offer a hug to her. For the first round, the Running Man wins easily but subsequently they added the number to nine participants and the Running man finally lost. Likewise, the participants were given autograph T-Shirts and caps for their participation. Time for some performance by the Running Man as they prepare behind stage, we were shown video clips of the Running Man members. In addition, they recorded a video message from Lee Kwang Soo to the delights of many but some of them were disappointed that Yoo Jae Suk did not appear in the video. Then the Running Man cast did song numbers and Jee Suk Jin sang ‘I swear’, a throwback to his comedic audtion in 1993. The atmosphere was high when Gary appears onstage and rap Leessang’s ‘Can’t break up girl, can’t break away boy’ and ‘you are the answer to a guy like me.’ After that, there was a rendition of Leessang’s ‘Turn off the TV’ by the Monday couple. Haha did a medley of ‘story of a little kid, ‘You are my fate’ and ‘Rosa’, along with ‘Busan Vacance’; and kim Jong Kook rolled out his famous ‘One man’ and ‘Today more than yesterday’. Staffs were holding the torchlight and walking about the place to stop fans from filming and taking photographs. 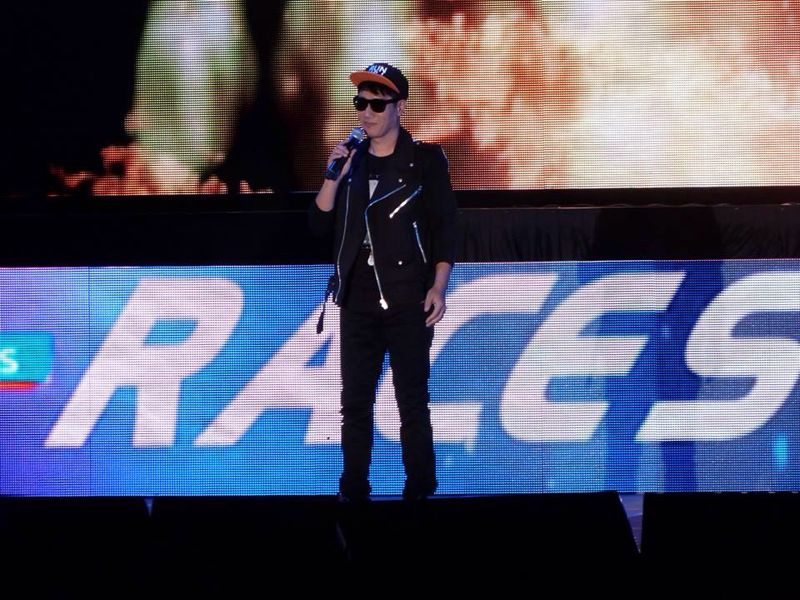 The finale was the greatest highlight of the day when the fans started to crowd at the front stage. They sang Leessang’s Humility is hard and Kim Jong Kook ‘Loveable’. These energies bunnies ran and dance around the stage while singing. They even prepared flowers to throw to the audience. I was pretty shocked when some fans reached out and snatched the flowers in a slightly chaotic situation. 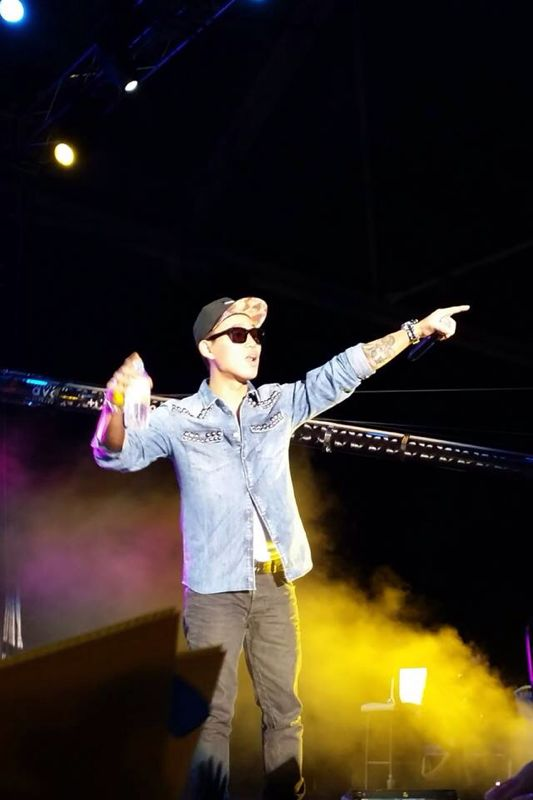 Haha and Gary splashed some water at the crowds and towels were thrown out to the fans. 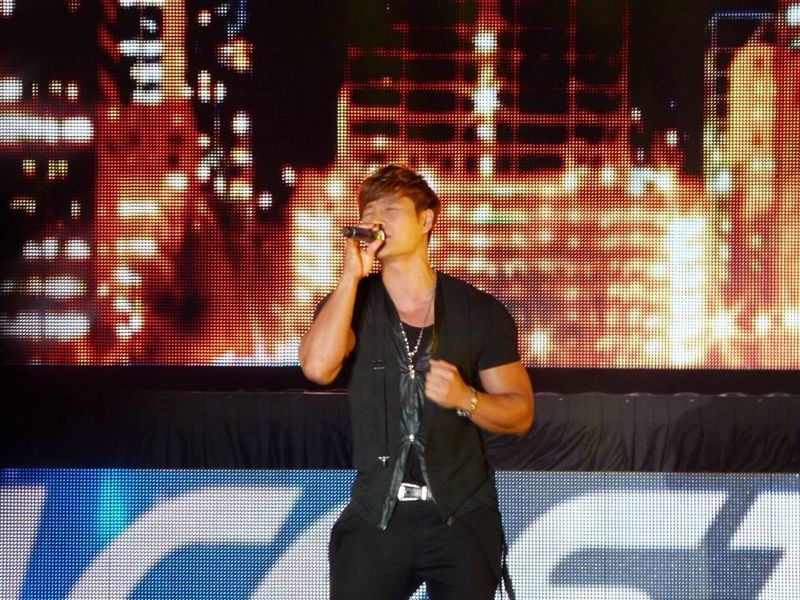 At one point, Kim Jong Kook even showed off his choco abs to the audience. 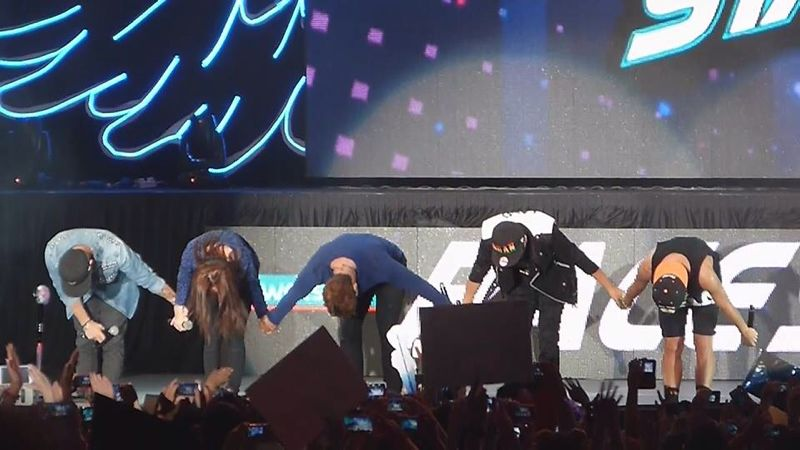 That marked the end of the performances as the Running Man cast hold hands and bowed down to the audience. They promised to come back next year with all the seven members and will suggest to the Running Man team to film in Singapore. After the Fan meet, they went for clubbing at the Zouk before they left Singapore the next day. Kim Jong Kook left Changi Airport at 2.30pm.